« Working hard, or hardly working? Office upgrade! Oh, sorry. That was my head hitting the keyboard as I fell asleep just thinking about it. In an attempt to make the 83rd Annual Academy Awards more young and hip, they paired two totally unrelated and uber-awkward non-comedians as hosts, showed clips from old movies, made Bob Hope appear via hologram, included a number of references to Facebook and texting (included a completely tired “There’s an app for that” line), and asked Kirk Douglas to present an award in the most awkwardly funny five minutes of Oscar history. So, yeah. All in all, a great success. Or something. It was 1 part awkward to 4 parts snoozefest. And I kinda feel like the red carpet was a perfect precursor to how the rest of the night would ensue: a little boring. But there were a few great looks. So why don’t we jump right in with those? Mila Kunis in Elie Saab. Fantastic. There is, in my opinion, nothing wrong with this look. She’s gorgeous, that dress is gorgeous and in a sea full of somewhat boring ensembles, this color was unexpected – in the best possible way. I might catch some flack for this, but Cate Blanchett in Givenchy Couture was at the top of my list. This dress was like art. Maybe the show and the red carpet fashion had me in a boredom-induced coma, but I thought this was one of the most exciting dresses of the night. Cate looked beautiful and I truly believe she is one of a very small number of Hollywood actresses who could pull of this dress. And she did. Bravo! Oh, Anne. My girl, Anne. You started off so well. This Valentino Archival number was so perfect on you. And then, the show started. And it was alllllll downhill from there, wasn’t it? I’ll catch up with Anne in a moment. All I know about Camila Alves is that she’s Matthew McConaughey’s perfectly tan, thin wife. And she looked 100% totally perfect in this Kaufman Franco dress. The black was understated, so she didn’t get a lot of attention, but I love the revealing top combined with the huge skirt. If I look a fraction as good as Helen Mirren does when I’m her age, then I will consider this a life well lived. She’s so classy and always dresses age appropriately even though she’s totally got the bod to rock something younger if she wanted. This Vivienne Westwood gunmetal gown was so on trend, so flattering and so age appropriate without being boring. High five, Helen! Hailee Steinfeld in Marchesa. But not just any Marchesa. They asked her to draw her “dream dress” and then they made it for her. I mean, a professional stylist couldn’t have done a better job making her look beautiful, timeless and most importantly, her age. To the stylist who told Amy Adams to wear that weird, green necklace and bracelet: YA FIRED! That necklace completely RUINED an otherwise perfect look. 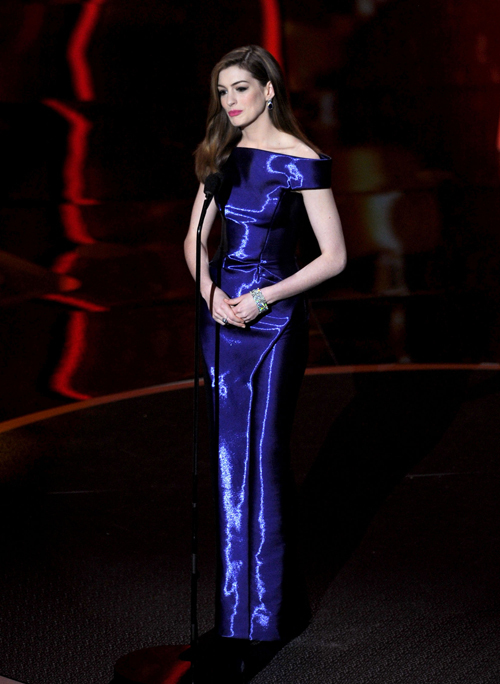 I loved the blue dress by L’Wren Scott. Apparently, she’s wearing $1.3 million worth of jewelry. About $1.3 million too much, in my opinion. Diamond drop earrings and a tennis bracelet would have been more than enough. Dear Sandra: See Amy. She has a necklace you can borrow. This Vera Wang gown is gorgeous, but something is missing, don’t you think? A necklace would have done the trick. Or maybe a softer hair or makeup style. This all seems really harsh. Jennifer Lawrence looked smokin’ last night. Great hair and makeup, and she’s clearly got the body for a dress like this one from Calvin Klein (Did anyone else see her bounce on over to Al Roker from the red carpet last night? Yowza.). But try as we might, we alllllll thought it when we saw her. While her hair was a vast improvement from the Golden Globes, Scarlet’s dress did nothing for me. She looked stiff, and the high lace neckline felt a wee bit Victorian. It was backless but…who cares? The fact that Gwyneth Paltrow made a number of “Best Dressed” lists today makes me really sad. The Calvin Klein dress isn’t terrible, but it’s not fabulous or even provoking in any way. Except maybe for that weird hip brooch. Let’s give her the “Most Strangely Placed Accessory Award” instead of Best Dressed why don’t we? I think she has the potential to be so beautiful, but more times than not, she just looks so….blah. And don’t even get me started on that barf-inducing country music performance (or the Michael Kors dress). Girl. Just stop. Does anyone remember trying on prom dresses at Elle? Yeah. That’s all I have to say about this. Yikes. Baby girl is one Dalmation away from looking like Cruella DeVille. I love Florence and the Machine, and I would have been disappointed if Florence Welch had shown up looking just like everyone else, but I’m pretty sure she pulled this out of either a) her grandmother’s closet, b) the nearest Goodwill, or c) her high school drama department’s costume closet. Ughhhhhhhhhhh. Melissa Leo totally freaks me out and makes me super uncomfortable. For one thing, trade ads trying to convince the Academy to vote for you for Best Supporting Actress? C’mon, girl. Then, you show up in an ill-fitting dress that looks like a football uniform made out of a doily. THEN, to top it all off, you win anyway and give the most obviously rehearsed “Oh my god I can’t believe it!” speech that’s ever been practiced in front of a bathroom mirror. Barf. And back to Anne. I love Anne Hathaway, but she and James Franco hosting together made for a super awkward evening, don’t you think? She needed some of his calming remedies (ahem) and he needed some of her happy pills. She seemed too desperate to be liked, and he seemed embarrassed to be on stage with her. No chemistry whatsoever. As for her million outfits, some were better than others, but when a beautiful young girl is hosting the Academy Awards, she should be dressed in the most fabulous dresses in existence. These were so not. But the Vivienne Westwood tux was adorable (as was her musical number) and the Versace red was super flattering on her. Aaaaaand that’s all folks. What are your thoughts? Do you totally disagree with me 100%? Did you sleep through the entire show? Are you so happy The King’s Speech won? Me too. Finally! – ahh, my day is complete. I agree with you 99.9%, but I actually liked Gwyneth on the red carpet in the sleek Calvin Klein. She doesn’t have to do red taffeta with a train to make an entrance, you know? Loved Cate and Halle. Poor poor Scarlett; she has no idea how terrible she looks. xo. No, Gwyneth would look totally weird in a big ballgown. My problem is less with her dress and more with the odd accessories and her hair. I always think she looks prettiest when she softens up her features a bit with pastel makeup and soft waves. Well…I didn’t watch the show so I can’t comment on that, but I did tune in to the red carpet. GOOD RECAP!! Cate Blanchett!!!!! Perfect, but then again, she usually is. Her dress, like you said…work of art. I also thought Sandra Bullock looked gorgeous. I liked the no necklace though. Just my preference. Loved your comment about Penelope Cruz!!!!!! So spot on, Rosemary, and hilarious. And your assessment of Reese Witherspoon cracked me up. I thought Jennifer Lawrence(must admit I don’t even know who she is) looked like a bimbo, and Florence Welch looked perfect…for her. I thought the dress suited her. So I liked it. And it was at least more interesting than the majority. Extreme hair envy. How do normal people (like me) get those waves? Hair tutorial, please? You started off with my very favorite dress! And I have to agree with you on Anne’s hits and misses. The tux was adorable. Thanks Gabriella! I just spent many minutes perusing your blog and I love it! How’d you find me?